For those of you have read any Greek mythology you probably remember Sisyphus. He was the mortal who challenged Zeus (among many other adventures) and was thus banished for eternity to push an enormous boulder up to the top of a mountain only to have it repeatedly roll down again. I've taken on a Sisyphean task to locate all the misuses of the GISP2 data from Alley 2000 and put them into proper context. The number of locations I find GISP2 presented as a global proxy on the internet is daunting, but like Sisyphus, I must keep pushing this bolder up the hill. In this new case I've located Dr. Ole Humlum PhD from The University Courses on Svalbard (UNIS), Norway. He is a professor of physical geography at UNIS. 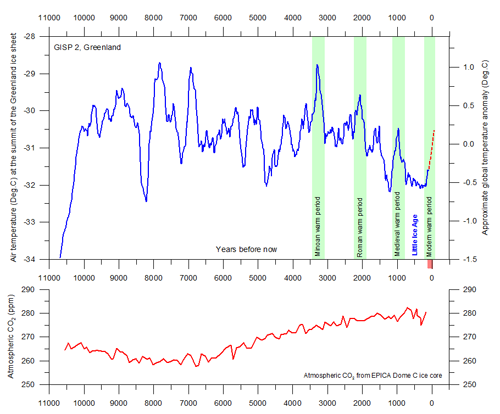 Dr. Humlum runs a website called Climate 4 You where he presents a wide range of data related to paleoclimate. What caught my eye was that Dr. Humlum makes the same mistake that everyone else seems to make. They append the modern instrumental record on the end of the GISP2 data to suggest that current warming is nothing out of the ordinary. But as I've previously pointed out in Crux of a Core Part 1 and Part 2 this is in error. This is comparing one high latitude local proxy (GISP2) with the modern global record. When I located this diagram on his website I wrote a short email to Dr. Humlum pointing out the error of conflating a local record with the global instrumental record and pointed him to Dr. Jason Box's website where Dr. Box shows that the temperature since at the Greenland summit has risen over 2C since the termination of the GISP2 data. You are entirely correct; my error. I will change it in a short while. Thank you very much for pointing this out. In response Dr. Humlum has, apparently, updated the chart but only to reflect ~1.0C, the lowest estimation contained in Box et al 2009 Greenland Ice Sheet Surface Air Temperature Variability: 1840–2007. With all due respect to Dr. Humlum, I need to put some shoulder behind this boulder and point out that Dr. Box has an additional 3 years of data past 2007 represented on his website that pushes the average temperature change up closer to 2.0C. The Greenland temperature anomaly for 2010 is 3C above 1855 but the average for the past decade has been 2C above 1855. You can see now that the rise in temperature, comparing local record with local record, shows that there has been a marked increase in temperature at the summit on a scale beyond any other change in the Greenland record except for the known 8.2k year event. Like any great Greek tragedy the story just keeps going. You'll notice that I've left the EPICA Dome C data in each of these charts, because Dr. Humlum is contrasting the two. Being that CO2 is a well mixed gas in the atmosphere I would suggest that this is also an act of conflating a global record with a local record. 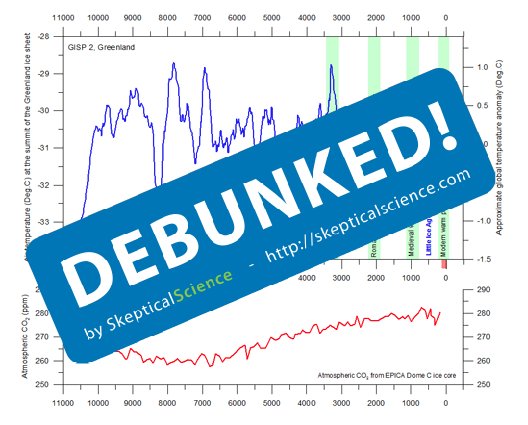 My response is to merely add in the modern record for CO2 concentrations on the EPICA data. Heck, if we're going to add the modern temperature data should we not also be adding the modern CO2 data? It only seems logical. I would venture to guess that the modern record was not added here because, given the scale, it doesn't fit. 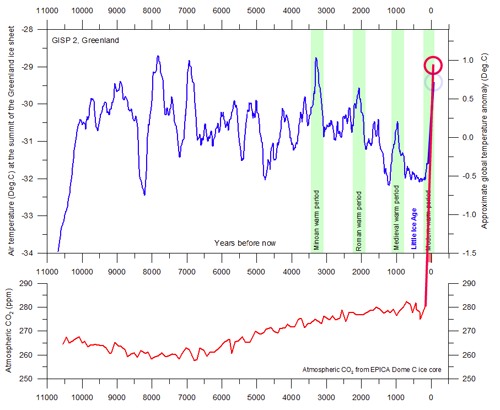 If we merely rescaled the CO2 data to match the known direct radiative forcing of 1C for a doubling of CO2 (to match the GISP2 chart above it) then the EPICA data through the Holocene would look pretty much like a straight line with a nice little hockey tip at the end. Fig 4 - Adjusted EPICA Dome C data with modern CO2 record appended. In the story of Sisyphus he is banished to his task by Zeus for Sisyphus' hubris in his belief that he was more clever than Zeus. Maybe this is my own hubris in taking on each of these presentations of GISP2. In Albert Camus' 1942 essay titled The Myth of Sisyphus he suggests that, actually, Sisyphus is quite happy in his eternal task. Sisyphus, he says, represents the eternal spirit of the human heart. If you want to know where I am, among other things, you can bet I'm happily browsing the internet looking for another boulder. Great post! It is a shame that the likes of Humlum couldn't be put at the bottom of the hill to await the return of the boulder. He would excape the boulder if he would update his chart with the 2010 number and the CO2 for the present. Even though the addition of 2010 does not make the chart more accurate, atleast it shows the spike up to past records in one year. i have to say, Dr. Humlum has been very gracious in my communication with him. I wouldn't lump him in with the denier crowd at all. He's closer to a true skeptic but definitely with a lean toward "it's not so bad" as far as I can tell. I've told Dr. Humlum about this post but he says he's off on another trip into the field with students and will be out of touch. He might pop in to comment once he's back from that trip. "According to ice core analysis, the atmospheric CO2 concentrations during all four prior interglacials never rose above approximately 290 ppm; whereas the atmospheric CO2 concentration today stands at nearly 390 ppm. The present interglacial is about 2oC colder than the previous interglacial, even though the atmospheric CO2 concentration now is about 100 ppm higher." This is based, I believe on a single ice core, the Vostok Ice core in Antartica. The figure discussed in this post is just below the gem above. I imagine Dr. Humlum forgot to update the Greenland temps to the most recent date, and forgot to mention that the forcing from changes in carbon dioxide have not all been realized. I imagine this web site would provide a treasure trove of topics for brave-hearted debunkers. Moderator Response: [DB] As an FYI, the highest CO2 levels in the Vostok core were 298.7 ppmv and occurred 323,546 years ago. Not that anyone's counting. Rob Honeycutt @2, having read some of the site, I think you are bing to kind. Anyone who can give as detailed a comparison of "global" temperature indices as he does without mentioning that only one of them is truly global is being very selective in the data they present to the public. Specifically in the case in question, any comparison between a local temperature record alone, and the global CO2 record is obviously invalid. What is more, I would suggest that any such comparison that fails to mention the host of factors causing additional variability in local temperatures compared to global temperatures (something entirely missing from his commentary) is inevitably misleading, and obviously so. Given that there are a significant number of reconstructions and/or proxies available that would give a better approximation of the global temperature record over that period, his choice of the very variable Greenland record is tendentious. Further, it is well known that CO2 levels have been rising in the atmosphere since the invention of agriculture due to changes in land use, mostly in the form of deforestation and the extension of wetland methane emission due to rice cultivation. This, clearly is something that should be discussed in any comparison of the Holocene CO2 record with temperatures, and is entirely missing from Dr Humlum's commentary. At the same time, any comparison of CO2 and temperature from before the Holocene, ie, when human activity is in fact irrelevant, is entirely missing from his page. That cannot be accidental. Tom Curtis... I don't disagree. Humlum has been very nice in my exchanges with him so I'm trying to give him the benefit of the doubt here. You're right, though, I think it's silly to use GISP2 as a definitive proxy for the Holocene. Even as a local measure of temperature I think it's dicy at many points. I seem to remember Dr Alley saying that there are parts of the record that are reflective of other things like snow drifts, and I believe Grootes 1993 (pointed out in Crux of a Core 2) states "The small Holocene O18 fluctuations of 1-2 occur too frequently to allow an unambiguous correlation between the cores." In other words, as far as I understand it, GISP2 is a fantastic record to study events like the Young Dryas but trying to infer Holocene temperature is more of a stretch. And that's pretty much my objection to almost every use of GISP2 that I see out there in the blogosphere. People, Dr Humlum included, are using GISP2 in an inappropriate manner. Rob Honeycutt @5, I am uncertain about the effects of snowdrifts on GISP2. The reason I object to using GISP2 (or any Greenland ice core) as a global proxy (above and beyond my more general objections against using any local proxy as a global proxy) is that Greenland dO18 is known to be unusually variable because of the North Atlantic Oscillation. In one mode of the NAO, the prevailing winds carry warm air onto Greenland from the Atlantic. In the other mode, it carries cold wind from the arctic. As I understand it, the O18 concentrations in precipitation are a function of the temperature of the water from which the water vapour originally evaporated, and the intervening atmospheric temperatures, and the temperature at the location of precipitation, the upshot is that dO18 gives a record of a regional temperature rather than a site specific temperature. This means that in one mode of the NAO, Greenland ice cores give a record of the temperature across the northern Atlantic and Greenland, while in the other mode, they give a record of temperatures across the Arctic and Greenland. Thus they will exhibit a greater variability than the actual local Greenland temperatures themselves; and a far greater variability than most other local temperature records. One piece of data that Dr Humlum presents is the correlation between global temperatures and the angular velocity of the Earth's rotation (or the inverse of the length of the day). "The length of day (LOD) as shown above are subject to variations due to variations in oceanic tides (smaller than 0.03 ms in absolute value), variations in the atmospheric circulation, and to internal effects and to transfer of angular momentum to the Moon orbital motion. Also the dynamical influence of the liquid core of the earth may account for slow variations, but then generally expressed as overall long-term trends (Akoi et al. 1982). The above diagrams show that periods with relatively high planetary rotation velocity (and low LOD) tend to be associated with relatively warm periods, and vice versa. Good examples are the peak of LOD in the early 20th century, concurrent with the last cold spell of The Little Ice Age and the loss of Titanic. Also the cold period 1965-1977 was associated with long day length (high LOD) and low planetary angular velocity. The generally increasing rotation velocity of Earth (and decreasing LOD) since then has taken place along with the period of late 20th century warming. Variations in LOD has also been associated with the Atmospheric Circulation Index (ACI) and variations in commercial catches of different fish species. Some of these associations are thoroughly described and discussed by Klyashtorin and Lyubushin (2007)." Given the fact that some deniers claim there is a causal connection between the Length of the Day and global temperatures, with changes in the LOD causing changes in global temperatures, it is questionable that there is no discussion of (or mention of) glacial mass balance in the same context. Looking closely at the LOD signal, it is very plain that there is a seasonal signal. The Earth has a longer day (ie, it spins slower) in the Northern Hemisphere winter. The cause of this is easy to attribute - snow. In the NH winter, large areas of the Earth are covered by a thick blanket of snow. The snow is, in the summer, found in the oceans, but in the winter it is found on land, and hence (on average) at several hundred meters greater altitude. Because of conservation of momentum, this shift of mass slows the Earth's spin, and hence lengthens the day. The annual trend in changes of the LOD have similar magnitude to the seasonal variations. (The change in the 37 month mean of the LOD from 1972 to 2009 was approximately 0.003 seconds, while the seasonal variation has a range of about 0.0015 seconds.) It is also not a monotonic trend. Therefore whatever the cause, we do not expect the Earth to shed and regain angular momentum, but rather only to shed and regain angular velocity. This means the cause must involve changes in the relative locations of significant masses. As hinted at above, the larges temperature correlated change in distribution of masses at the Earth's surface is the change in glacial mass balances. As glaciers melt, the melt water finds itself either directly or indirectly in the sea, thus redistributing the mass by up to 10,000 km towards the Earths axis. Because tropical glaciers can be involved in this mass redistribution, the relative size of the effect for a given mass moved should be larger than the seasonal snowfall effect as tropical and subtropical glaciers are further from the Earth's axis of rotation. Following are the changes in mass balance for non-polar glaciers, and for Greenland. Clearly it would be very difficult to predict the change in the LOD from known changes in glacial mass balance, but it appears to me that the pattern in those changes can be seen as a long term trend driven by loss of mountain glaciers, modulated by the changes in Greenland's mass balance. The changes in Greenland's mass balance are, of course larger than the changes in mountain glaciers in absolute terms, but Greenland is much closer to the axis of rotation. Funny how a few visual aids can help put things in perspective. Figure 3 was a nice touch. For all practical purposes, the CO2 level is completely flat in your graph. Should'nt it contain oscillations that reflect past ice ages? 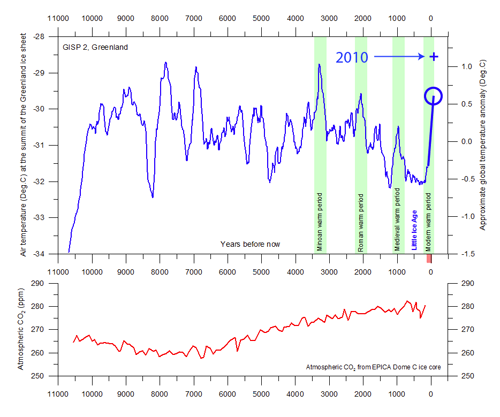 What the graphs seems to transmit is either we never had any ice ages, or if we did, CO2 ppm has no bearing on temperature. The great spike at the right also suggests this even more when you consider how little temperature has changed in recent years. Moderator Response: [DB] The graph of which you speak is clearly labelled as depicting the rate of change per century. As such it is a direct, apples-to-apples comparison between time periods. Apologies to the Bard, but "Context is the thing." It is indeed a stunning perspective, that I will incidentally use in a few weeks in a presentation on CO2. I calculated the other day that current CO2 increase is about 2 ppm per year, whereas the increase rate during the last deglaciation was in the order of 0.007 ppm per year. More than 2 orders of magnitude smaller! Yeah, that 'rate of atmospheric CO2 change' graph ought to be added to the 'CO2 increases are natural' rebuttal. I knew that CO2 increases of about 100 ppm took thousands of years throughout the interglacial cycle as opposed to mere decades now, but seeing that represented visually really drives the point home. The only 'problem' with the graph is that natural rates of change have always been so small in comparison that they are practically invisible at this scale. It might be worth having a 'blowout' at a more detailed scale to show that there were natural variations going on... they were just insignificant compared to the current human driven change. I sometimes use logarithmic scales when I have small values and large values on the same graph. But, then, I also sometimes have trouble when viewers don't understand just how large the actual differences are when looking at said graph. RSVP... Please note that my Fig 4 graph is Holocene only. Tom @ 6... Here is where I get some of the information regarding misuses of GISP2 data, and specifically the idea that snow drifts can cause some anomalous readings in the data. It's some material posted on Andy Revkin's Dot Earth blog. Second, although the central Greenland ice-core records may provide the best paleoclimatic temperature records available, multiple parameters confirm the strong temperature signal, and multiple cores confirm the widespread nature of the signal, the data still contain a lot of noise over short times (snowdrifts are real, among other things). An isotopic record from one site is not purely a temperature record at that site, so care is required to interpret the signal and not the noise. An extensive scientific literature exists on this topic, and I believe we are pretty good in the community at properly qualifying our statements to accord with the underlying scientific literature; the blogospheric misuses of the GISP2 isotopic data that I have seen are not doing so, and are making errors of interpretation as a result. Figure 3 clearly shows that variation of Greenland summit temperatures are * not* correlated with the variation of CO2 in paleoclimatic data (whatever this means - there is no obvious correlation). Given this objective fact, why use the current rise of Arctic temperatures as evidence for the influence of GHG ? Remarkably , the recent loss of Arctic ice is *not* related to a particularly high change in average temperatures. Actually the last decade has not shown any significant trend, and certainly not an acceleration. Moderator Response: [muoncounter] See global warming stopped in... for documentation that 'the last decade has not shown any significant trend' is false. Gilles... You're in active pursuit of a straw man argument. I highly recommend you read the comments made by Dr Alley in Revkin's article that I linked above. Gilles... You also might check out Dr Box's website which shows the modern temperature record for Greenland. You'll see that "no significant warming trend in the past decade" is demonstrably wrong. Being a Norwegian citizen, I know how the Norwegian climate deniers operate. Ole Humlum is a climate denier in the true meaning of the term. He is not as flexible as Rob Honeycutt might think. Don't be fooled by his "charm", Rob. He likes to spread confusion and misrepresentations. His favourite arguments are: "Global warming stopped in 2000", "it's the sun" and "it's cosmic rays". As the majority of the audience on this site speaks English, I can only supply a limited amount of articles featuring Humlum, but here's one: "Another Unfortunate Truth – Global Warming Stopped"
Humlum has striken again this week... Using Fig. 1 without even changing anything, in a full page article in a weekly newspaper for Engineers (Teknisk Ukeblad). Given that you shared your comments with him and he didn't even took them into account in his latest achievement (I wish you could read it, it is worth it, full of classical denier's arguments), Bjarne is right, Humlum is a real denier. I just took a look at Humlums website and he is still using the same diagram. He also defended the use of it in Teknisk Ukeblad (may) now in august. Rob @2 "I've told Dr. Humlum about this post but he says he's off on another trip into the field with students and will be out of touch. He might pop in to comment once he's back from that trip". I think he's back from that trip since he is constantly updating his website (but not the diagram and his a priori denialist beliefs). Perhaps Rob should write him again? Stig... I think he did adjust the chart but only to reflect the very lowest possible value presented by Dr Box's data. I'm going to take the long term approach to this and contact him when Dr Box publishes newer data. And I'll continue to contact Dr Humlum on an ongoing basis as newer data becomes available. The good news here is that because SkS has become a popular destination for people researching climate change issues, our articles on Humlum are more likely to come up in a google search than Humlum's site. So, people are more likely to learn about Humlum's site from us than anywhere else. In essence, we get to frame his work prior to people reading his work. Thanks Rob. Then there should be more posts relating to his website ;) It is clever, but misleading. 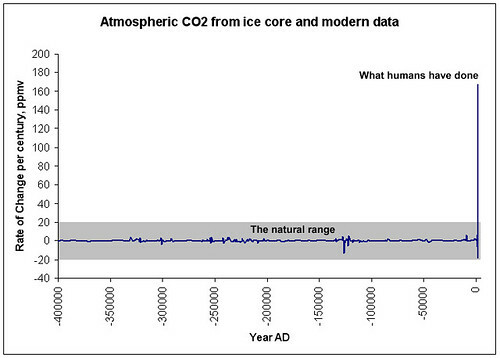 Humlum may have adjusted the chart, but his a priori belief is that CO2 has nothing to do with global warming. The chart, adjusted or not, reflects this belief. 3. Box et.al. 2009 end their data in 2007, but Box has an additional three years of data that Humlum is not using. To me that makes his diagram/chart five times misleading, but I may be wrong. Does anyone know of others who have been examining and debunking Climate4you? I've been doing various web searches but am coming up disappointingly empty. citizenschallenge - That site, and Ole Humlum in general, have been discussed here. Search on "Humlum", which will take you to here, here, or here. Ole Humlum has repeatedly focused on the GISP2 core (a local record), leaving out or incorrectly matching the recent instrumental record, cherry-picking short time frames, and in general making a hash of the data to support his "it's not happening" points. Rob Honeycutt's Crux of a Core series addresses this topic quite thoroughly. ...Regarding previous comment - But of course, you knew that, since we're commenting on the Crux of a Core thread in the first place. I have to be more careful about context when following recent comments - sigh.